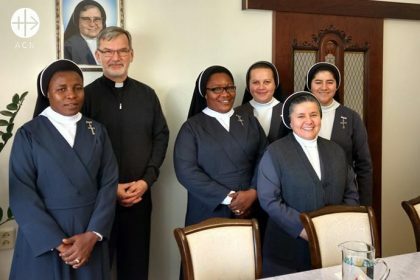 It would be hard to give a clearer illustration of the universal character of the Church than this: two Nigerian religious Sisters from the Poor Clare Missionaries of the Most Blessed Sacrament – which was founded in Mexico – are travelling to the Diocese of Saratov in Russia to help with pastoral and catechetical work under the direction of Bishop Clemens Pickel, from Germany. But first of all Anastesia Ndubuisi and Cordelia Enwereuzo must learn Russian. “They are making progress”, says Bishop Clemens Pickel, who recalls how shocked the two women were when they saw the mist and snow for the first time. His diocese is something of a melting pot of cultures. 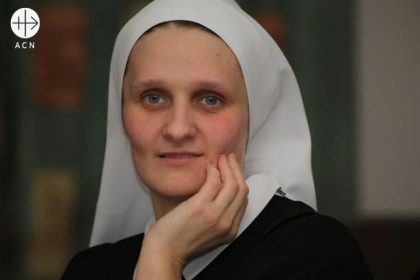 Most of the 61 religious Sisters, who belong to different congregations, come from abroad – “anywhere from Argentina to the Philippines” – including a good number from Poland. Part of the melting pot of Saratov: Bishop Clemens Pickel with his international team of religious Sisters. In fact, without the help of these foreign Sisters this diocese, one of the largest in the world, would not be able to function. There is a great deal of travelling involved, since the 20,000 or so Catholics account for just 0.04% of the 45 million people living in the diocese. For these and the many other Christians Anastesia and Cordelia have been learning Russian. But they have no way to pay for their language tuition (€3,000) or, like the other Sisters, even support themselves in the country. “We call it ‘existence help’, and with good reason”, says Bishop Clemens, thoughtfully. For it really is about the very existence of the diocese itself. We are helping with €35,000. An international ecumenical conference with prominent attendees was held on 12 February in Moscow to celebrate the third anniversary of the historic meeting between Pope Francis and Russian Orthodox Patriarch Kirill, which took place on 12 February 2016 in the Cuban capital of Havana. The event was hosted by the chairman of the Department of External Church Relations of the Moscow Patriarchate, Metropolitan Hilarion of Volokolamsk. The Vatican was represented by the President of the Pontifical Council for Promoting Christian Unity, Cardinal Kurt Koch, and the President of the Pontifical Academy for Life, Archbishop Vincenzio Paglia. The conference was attended by further dignitaries of both churches, including the Apostolic Nuncio to the Russian Federation, and international experts. 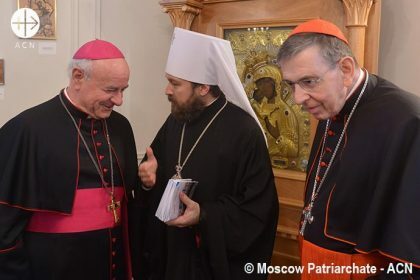 From left to the right: Archbishof Vincenzo Paglia, President of the Pontifical Academy for Life; Metropolitan Hilarion (Alfeev) of Volokolamsk, chairman of the Moscow Patriarchate department for external church relations,; the president of the Pontifical Council for Promoting Christian Unity, Cardinal Kurt Koch. The theme of the conference was “Death and Dying in a Technological Society”, with a special focus on the issue of euthanasia. Each year, the anniversary of the meeting in Havana is celebrated by an event dedicated to one of the issues that were included in the joint declaration of the two church leaders as challenges that both churches are facing and for which a joint solution needs to be found. The pontifical foundation Aid to the Church in Need (ACN) was represented at the conference by the head of the organisation’s Russia section, Peter Humeniuk. ACN has been working to establish a dialogue between the Catholic and Russian Orthodox churches for over 25 years and, in response to the joint declaration of the pope and patriarch, has founded an ecumenical working group to “realise the closer cooperation between the two churches that both church leaders have called for,” explained Humeniuk, who is himself a member of the working group. “It is imperative that the document does not remain merely a piece of paper, but is put into practice in real life. After all, these are the crucial questions of our time that we urgently require an answer for. For this reason, we are supporting ecumenical initiatives that, for example, address the protection of human life from conception to natural death and provide pastoral care for people with addiction or with psychological disorders or assistance for mothers in crisis situations. We are also looking for ways to work together to help persecuted Christians in the Middle East,” Humeniuk continued. One of the speakers at the conference in Moscow was Archpriest orthodox Aleksandr Tkachenko, the founder and head of a children’s hospice project that was initiated in 2003 in the eparchy of Saint Petersburg. ACN has supported the project from the very beginning; it provides palliative, pedagogical and pastoral care to terminally ill children and assistance for their family members. During the conference, Archpriest Tkachenko publicly thanked ACN for its support. 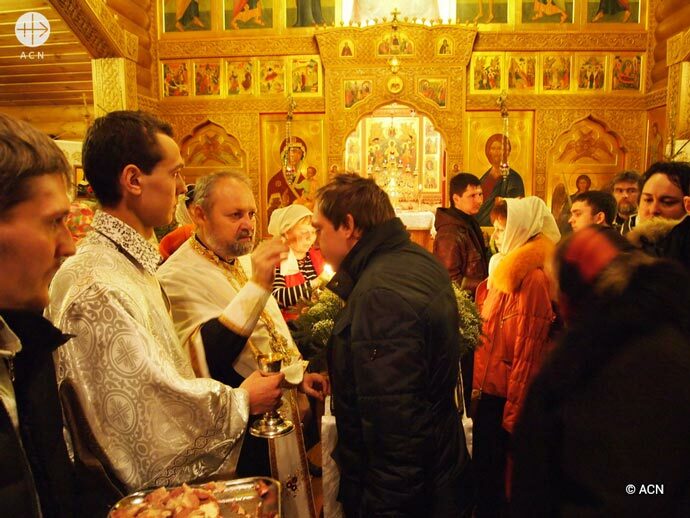 The diocese of Saint Joseph In Irkutsk, in eastern Siberia, is geographically speaking the largest diocese in the world. With an area of almost 10 million km² it is actually larger than the United States! Scattered thinly across this vast region are 50,000 Catholics, ministered to by around 40 Catholic priests. In addition there are 63 religious sisters of various different congregations. Their work in the parishes is absolutely indispensable, and in addition they are involved in all kinds of charitable and social work that is a veritable blessing, above all for so many children from broken homes and for the lonely, the elderly, the sick and the homeless, including many street children. In the city of Irkutsk for example, in the parish of the Immaculate Heart of Mary, two sisters of the congregation of the Servants of the Holy Spirit work with children from difficult family backgrounds, including children living in poverty, from large families, or with parents who are alcoholics. They have opened a house which they call the House of Hope. The children come here every day to do their schoolwork, to eat and to play. The sisters organise a range of different activities for them, helping them with their schooling and striving to create a real family atmosphere, so that the children can experience something there of what they have never known in their own families. The same two sisters also regularly visit the children at the tuberculosis clinic, organising a range of activities for them, and similarly for the children in hospital, suffering from cancer. In Abakan the sisters have made space in their convent for homeless women with children and at present they have two mothers and three children staying with them. They also visit the sick and elderly. We are helping all 63 religious sisters from the various different congregations in their work in the diocese of Irkutsk with a small contribution for their financial support. All in all it comes to a total of 31,500 Euros – or just €500 per sister for an entire year. Would you be willing to help us?